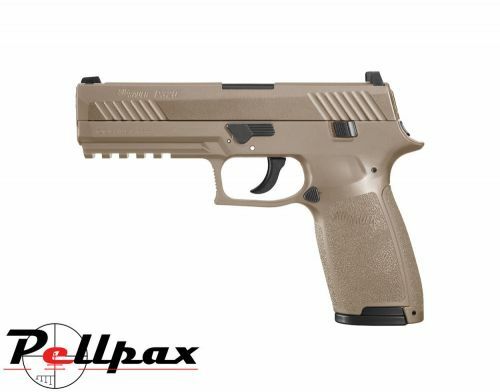 Sig Sauers range of high quality Co2 air pistols has now been expanded with the introduction of this latest model which features a 30 shot rotary magazine for massive shooting enjoyment and more time spent shooting before having to reload! The frame of the pistol is made from a high impact polymer for a strong construction and strong grip thanks to the texturing on the grip panels. The slide is then made from metal just as the original for a solid and heavy weight, and handling just like the real thing. The front underside of the pistol also features a weaver rail for the mounting of additional accessories. The pistols blowback mechanism has a very crisp and clean action on each shot for a great feeling of realism and the pistol fires each pellet down the rifled steel barrel which provides great accuracy and precision for both target shooting and plinking.